Here’s a tally of 10 services my office could provide you or your family in 2016. 1. Trouble with a state agency (PennDOT, Department of Human Services, Department of Labor and Industry, etc.)? – Contact my office and we can make an inquiry on your behalf. 2. Need state tax forms, birth certificate applications, voter registration forms, etc.? Contact my office and my staff will provide the necessary forms as well as guidance on any state processes. 3. Need brochures or publications for yourself, families, or friends? Review the various publications available and contact my Red Hill Office at 215-541-2388 to get your free copies. Large orders may require additional time. 4. Share your thoughts/opinions/experiences regarding pending state legislation. – Send me an email or contact my office. 6. Apply for an internship with my Red Hill office. – Complete the intern application form. 7. Planning a trip to Harrisburg? – Sign up for a capitol tour online or call my Harrisburg office at 717-787-3110. 8. Receive periodic updates about my activities in the 24th Senatorial district as well as my actions in Harrisburg – Sign up for my e-newsletter or call my Red Hill office at 215-541-2388 and ask my staff to add your email to the distribution list. 9. Schedule a meeting with me – Contact either my Harrisburg office at 717-787-3110 or my Red Hill office at 215-541-2388 for more information. If you would like me to speak at an event, complete the speaking invitation request form. 10. Remain updated on my prime-sponsored legislation. – Visit my prime-sponsored legislation page. Jamie Waite, Service Officer, for the Montgomery County Veterans Affairs office will be available on February 25 from 1 p.m. to 4 p.m. at my Red Hill office to offer assistance to veterans. Jamie Waite can assist veterans, their dependents, and survivors regarding their rights and the various county, state, and federal benefits they may be entitled to receive and assists them to apply for these benefits. In addition, she can screen for presumptive conditions that veterans can claim for disability, provide eligibility information on VA healthcare and more. It is the responsibility of lawmakers to cut costs and manage the commonwealth’s assets, but every citizen can play a role in making government operate more efficiently. 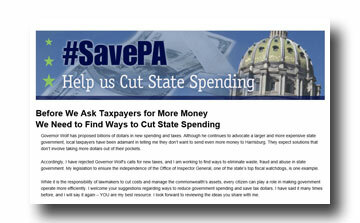 I’ve created a SavePA page on my website to receive your suggestions regarding ways to reduce government spending and save tax dollars. This has never been more important than now, with a governor determined to raise billions in new taxes to balance the budget rather than looking for ways to reduce spending. I have said it many times before, and I will say it again – YOU are my best resource. I look forward to reviewing the ideas you share with me. This edition of the Mensch Report features the Upper Perkiomen Valley YMCA. The Upper Perkiomen Valley YMCA serves Pennsburg, East Greenville, Green Lane, Hereford, Palm and the surrounding communities. They offer a wide range of programs for children and teens including swim lessons, sports, fitness, karate and day camps. For adults and seniors, the Y has personal training, a variety of group exercise classes, water aerobics and free babysitting services. Join me on a tour of this beautiful facility. Depending on where you live, you may be able to save money by switching your electric supplier. In Pennsylvania, you can choose the company that generates your electricity - also known as your electric supplier. This means that you have the power to switch to a competing supplier who can offer the lowest price or provide a specific service you want, such as green/renewable energy. As part of an expanded technology pilot, you can now view hundreds of plow trucks on interstates and expressways this winter at www.511PA.com. By clicking on the “Plow Trucks” box at the 511PA site, you can view the location of more than 500 PennDOT plow trucks and more than 200 contracted rental trucks this winter through the 511PA website. Statewide, PennDOT has more than 2,200 total department-force trucks and also rents approximately 270 trucks and their operators to maintain the more than 40,000 miles of roadway for which PennDOT is responsible. The AVL system pilot is part of a GO-TIME initiative that leverages inter-agency coordination and collaboration to maximize efficiency, modernize state government operations, and provide the highest quality services. The pilot, as one of seven GO-TIME projects identified by PennDOT in 2016-2017, is expected to realize a cost savings of $1.4 million over the next four to six years based on a combination of reduced salt usage and better use of department equipment. Application forms for the Department of Revenue’s Property Tax/Rent Rebate Program are now available for eligible residents to begin claiming rebates for property taxes or rent paid in 2015. Each resident who prepared or filed a paper rebate form last year (not using computer software) should have received a 2015 application by now. Renters who prepared or filed claims last year using computer software rather than the PA-1000 booklet received letters by mail reminding them to apply for 2015 rebates and providing copies of the PA-1000 Rent Certificate. There is no charge to apply for a rebate. The department reminds residents that applications and free filing help are available at no cost from Department of Revenue district offices, local Area Agencies on Aging, senior centers and state legislators’ offices. Claimants must reapply for rebates every year because rebates are based on annual income and property taxes or rent paid each year. Spouses, personal representatives or estates may file rebate claims on behalf of claimants who lived at least one day in 2015 and met all other eligibility criteria. The deadline to apply for a rebate on property taxes or rent paid in 2015 is June 30, 2016. Rebates will be distributed beginning on July 1, as specified by law. More than $269 million in property tax and rent rebates were sent to more than 564,000 homeowners and renters across the state for taxes and rent paid in 2014. The Pennsylvania Department of Military and Veterans Affairs (DMVA) is once again accepting applications for the Persian Gulf Conflict Veterans Benefit Program thanks to an amendment to legislation that extends the application deadline to Aug. 31. 2018. Served on active duty in the Persian Gulf Theater of Operations during the period from August 2, 1990 until August 31, 1991, and received the Southwest Asia Service Medal. Received the Southwest Asia Service Medal. Individuals who received a bonus or similar compensation from any other state are not eligible for the Pennsylvania program. The deadline for applying for benefits under the program extension is Aug. 31, 2018. PA Turnpike TOLL BY PLATE is a new license plate tolling system. If you are not an E-ZPass customer you will receive a bill in the mail. Cameras on the overhead gantry at the new PA Turnpike Bridge cashless tolling point over the Delaware River capture a vehicle’s license plate at highway speed, and a toll bill is mailed to the registered owner. Currently the PA Turnpike TOLL BY PLATE program is only available at the new cashless tolling point at the PA Turnpike Bridge over the Delaware River. High-speed cameras mounted on gantries over the roadway capture license plate images as vehicles pass through the tolling point at highway speeds. The registered owner of the vehicle receives an invoice for all trips made through the tolling point. Vehicles are charged a flat rate at the new PA Turnpike Bridge tolling point as they travel westbound over the Delaware River from New Jersey into Pennsylvania. The toll is charged for travel in only one direction. Eastbound vehicles crossing the PA Turnpike Bridge into New Jersey are not charged. Currently, the PA Turnpike TOLL BY PLATE program is only available at the new tolling point at the PA Turnpike Bridge over the Delaware River. Customers have 20 days to pay their invoice before a second invoice will be issued. If the first invoice is not paid, the second invoice will include an additional fee of either $5 or the equivalent of 1.5% of the total amount owed, whichever is higher. Customers with rental vehicles should check with the rental company about their policy with regards to travel on toll roads. The Department of Military and Veterans Affairs (DMVA) today announced the availability of up to $550,000 in competitive grants from the Veterans’ Trust Fund (VTF). Up to $400,000 in competitive grants to veterans service organizations and 501(c)(3) non-profit organizations with a mission of serving Pennsylvania veterans, focusing on four areas of emphasis: homelessness, post-traumatic stress disorder (PTSD), employment and workforce development initiatives, and other programs or services that address newly identified, unmet or emerging needs of veterans and their families. Up to $150,000 in competitive grants to County Directors of Veterans Affairs or the Pennsylvania Association of County Directors of Veterans’ Affairs, focusing on three areas of emphasis: veteran outreach initiatives, veterans’ court initiatives, and other programs or 6 services that address newly identified, unmet or emerging needs of veterans and their families. Since the VTF was established in 2012, more than $830,000 has been awarded in competitive grants. Grant information can be found at www.vtf.pa.gov. Grant applications must be received at DMVA by 4 p.m. Eastern Standard Time on Friday, Feb. 5, 2016. Late submissions will be administratively rejected without review. DMVA is authorized to solicit and accept donations to the VTF on behalf of the Commonwealth of Pennsylvania. Tax-deductible donations to the VTF can be made to: PA Veterans’ Trust Fund, Bldg. 0-47 Fort Indiantown Gap, Annville, PA 17003.